I went through an interesting exercise the other day and the results were really eye-opening for me and I wanted to share them. Just about all of us get the pleasure of paying an electric and gas bill every month and most of us are aware that our heating and air conditioning is responsible for a large portion of that bill, especially when it's hot or cold outside and the systems get used a lot. We try to save money by setting the temperature inside lower/higher, open windows, wear sweaters... the list goes on and on. But do we really know how much we're spending? I didn't and some of the work I was doing for a customer to investigate his actual cost lead me to investigate my own as well. The method I used isn't one that was taught to me or standardized by any organization that I know, so take it with a grain of salt. Its not particularly scientific and any similarity to any other method is purely coincidental and I will certainly give credit if someone else can point out where this has been used before. That being said, here's the issue: we all pay utility bills every month and I'm sure most of us would like to see them get smaller, but where do we start? Are we paying more than we need to for HVAC operation? Do we have other energy users that are costing us? How do you know? What you see there is a year of data from my gas and electric bills. You can see my gas baseline is in August (which makes sense) and my electrical baseline is in October (not in December or January because we have to use an electric heater in our Bonus Room to make it comfortable). I then subtracted those from all the months to reveal how much Gas and Electric were used to heat and cool the house all the other months. What we end up with is $577 of gas and $428 of electricity that was used to heat and cool my house. Everything that was left - $150 in gas and over $1,200 in electricity were consumed by other energy users in the house. 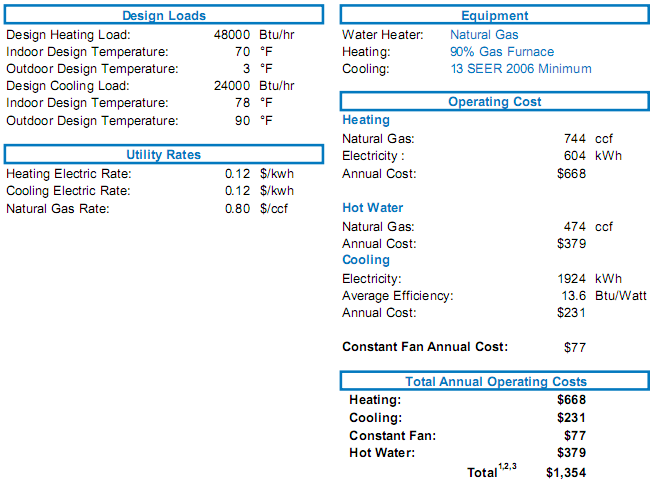 If we subtract the water heating cost we get a total of $975 per year for HVAC costs. The actual costs were $1004 and we had a very hot summer. Overall I'm pretty happy with how close the estimates were and it really opened my eyes to the fact that I have over $100 a month in electrical costs that isn't air conditioning! (Time to turn off those lights and computers when they're not being used). On a parting note - remember that customer I said I was working with? He has a Geothermal system that we installed for him last year. In a house that is twice as big as mine he's going to be spending less heating and cooling it. As long as he can keep his other gas and electric use under control he's going to be in great shape. If you find that your Heating and Cooling costs are out of control or just want to find out what they actually are, give us a call or contact us using the link above. You might be surprised just how much you're spending and how much you stand to save.